As a beginner, you were satisfied with a small tank — it was easy to clean, did not take a lot of space, and did not need much equipment. However, as time passes and your passion grows more and more, you will want a bigger tank (at least a 100 gallon aquarium), more exotic fish, and additional beautiful plants. This tank is a perfect choice if you are not ready to make a huge investment, but you want to upgrade your fish tank. The kit includes everything you need to set-up your aquarium and the Black Ventura stand will fit in any room. The tank itself is classy and elegant, without any frames that could distract the view from your amazing fish. With the filter hidden in the back of the tank, it will not disturb your plants in any way. Overall, it is a great investment that will bring you more benefits than you think! This is a creative tank that allows for building your stand piece by piece for a simple aquarium without other accessories. For many people, it is more exciting to build everything from scratch and to know that you worked hard to create your new aquarium. This tank has a spectacular shape that will make everything look ten times more amazing. It is made from acrylic, not glass, therefore it is much stronger and you do not have to worry about scratching it and the material will prevent any temperature fluctuation. It is, indeed, one of the best choices you can make. This tank is for the person that wants to have everything installed as soon as possible.It is considered one of the best kits on the market because it gives you everything you need. The tank itself is simple, but very elegant and it comes with a blue or black background. Each tank comes with a dry or wet filter, depending on your needs. Of course, you can add any other equipment because the hood has special compartments for a heater and light. The company is so proud of this product they offer a life-time warranty against leakage. This 100 gallon aquarium is one of the most popular when it comes to tanks. All their products are high quality and have the perfect accessories. This 100-gallon tank is a must have if you are a beginner. You have the chance to learn how to adapt the accessories and how to play with different plants and decorations. It is suitable for fresh water or saltwater fish, and you can easily choose an elegant hood for it. The walls are built from acrylic, not glass, so you will have a better image and it will not break it or scratch. This tank is a piece that is worth every dollar. Every detail of this tank is carefully polished and the final look is truly spectacular. Its unique shape will make it the center of attention in any room and the professional equipment will make maintenance a very easy job. The back of the tank is completely flat, so you can easily place it on a wall. The kit includes every piece of equipment that you can ever need, from a professional filter to a thermometer. Even more, the LEDs that are incorporated in the hood will not only provide enough light in the daytime, but they will also allow you to admire your fish at night. Absolutely, one of the best investments you can make. This is one that only needs a single look for you to see why it is considered one of the best. The curved shape and the flat back will offer a panoramic view that will impress any visitor. Plants can be seen from every angle without effort. The filter is mechanical, biological, and chemical, so you do not have to worry about the cleanliness of your water. Since the equipment is so advanced, you will not be disturbed by any noise because the pump and the filter are completely silent. You can hide the light bulbs perfectly in the hood, so the only thing that you will see will be your perfect aquatic environment. The price is higher than most, but even so, it is definitely worth it! Do not be trepidatious to invest in a bigger tank such as a 100 gallon aquarium. It seems like a lot of hard work, but actually it is simpler to take care of a large tank than a small one. You do not have to change the water so often and they have such advanced filters that you do not have to interfere. Besides, no matter what you add to your tank, you will not cause a chemical imbalance. Once you install everything, there is not much else that you have to do. 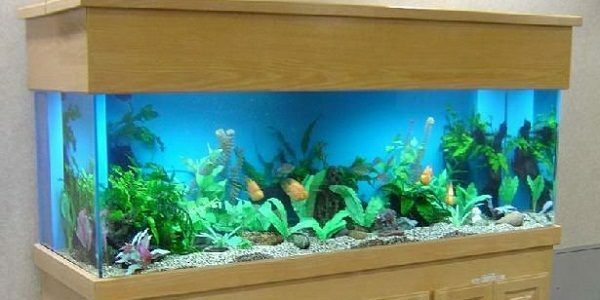 When it comes to the financial investment, it is actually cheaper to maintain a large 100 gallon aquarium. Besides, there are so many amazing kits on the market that you do not have to pay a fortune to have the aquarium that you want. Most of the time, a kit will include all the small accessories that you can never find and help to create the aquatic atmosphere you seek. Indeed, this is one of the greatest passions that you can have! Do You Need an Aquarium Stand? I am looking to get a 100 gallon tank, place it into wall and add fish & decorations from there.